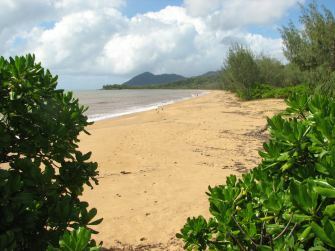 After a very busy and hectic week, we decided to take some time off yesterday and go for a drive to Mission Beach, south of Cairns, on the Cassowary Coast. 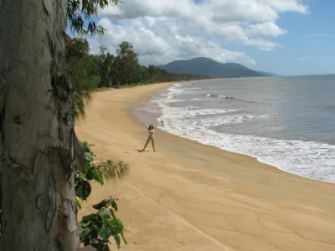 We cannot believe it’s already almost a year since we stopped at Mission Beach on our way to Cairns. Time definitely flies. However, this time we weren’t as stressed (starting a completely new life on the other side of the world is a good cause to be stressed) and the weather was absolutely beautiful. So we had a wonderful and relaxing day, that started as soon as I left Steve drive. We set up early in the morning after working for an hour or so (we’ve already told you we are getting busier by the day, haven’t we? 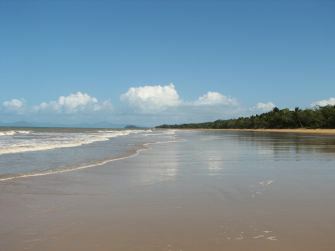 ), and our first stop for the day was Brampston Beach, a few kilometres east of Babinda. As it is fairly usual in Australia, we found ourselves completely alone in a fantastic beach, long and deserted, as you can see in the photos. Then we continued our way to Mission Beach, a fabulous spot of the east coast of Australia. We stop here for lunch at the resort and I can tell you that had the most fantastic seafood basket ever (probably because it ’s the first time I actually order a seafood basket, normally I don’t go for fried fish, but it really was delicious). And we finished our meal with a fantastic caramel cheesecake. 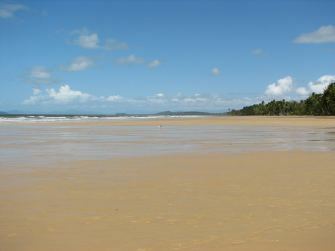 The beaches here are absolutely breathtaking, just have a look at the photos and decide for yourself. 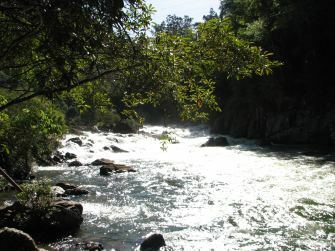 And just before heading home we made a short visit to Tully River, just outside the fruit picking town of Tully, hoping we would still see people white water rafting there. Unfortunately we were a bit too late and they had already left, but we got to see why the river is so good for this sport. But what we saw were lots of backpackers in the streets of this quiet town, whom we assume are here on their working holiday visa.